Well it's only 4 weeks to go to my big craft show at the red cone, i have made a start on my cards and have started making gift boxes today, in between the Christmas cards and other things i am making, my sister in law asked for a supply of cards, which she normally buys about 20 in one go. so all last week i was making her cards. Here are some of my sister in laws cards hope you like them. in November and my big craft show at the red cone. 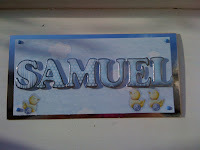 here's a pic of my card to Sam.